Telemedicine is defined as, “the use of telecommunication and information technologies to provide clinical health care, at a distance,” by means of a growing variety of applications and services, using two-way video, emails, smart-phone technology, wireless tools and other forms of telecommunication technology. Originating more than 40 years ago as a solution for hospitals extending medical care to patients in remote areas, telemedicine is now a significant and rapidly growing component of health care in the United States and is integrated into the ongoing operations of hospitals, home health agencies, specialty departments, private physicians’ offices and the consumer/patient’s home and workplace. Telemedicine products and services do not fall into a separate medical specialty. Instead, telemedicine is most often part of the larger investment by healthcare institutions, either in the delivery of clinical care, or information technology. Generally speaking, there is no distinction made between telemedicine and those services provided on site — even in the reimbursement fee structure. Plus, there is no separate coding required for billing of remote services. Telemedicine incorporates a wide array of remote healthcare services, including: video conferencing patient consultations, transmission of medical records and still imagery, remote monitoring of vital signs, continuing medical education for physicians, nursing call centers and consumer-focused wireless applications, and e-health, including the use of patient-portals. In its brief history, telemedicine has become a technological solution to alleviate the stresses of health care for patients and reduce the high operating costs for service providers. Telemedicine allows patients who are unable to travel access to the same quality of health care they would receive in-person. Removing the need to travel and adding the flexibility of being remotely located improves monitoring of patients with chronic ailments and eliminates the loss of income and travel expenses associated with in-person checkups. Telemedicine is saving patients money, and it is an opportunity for doctors to streamline their practice. Doctors who can remotely meet with patients are able to reduce their overhead, while seeing more satisfied patients in less time. 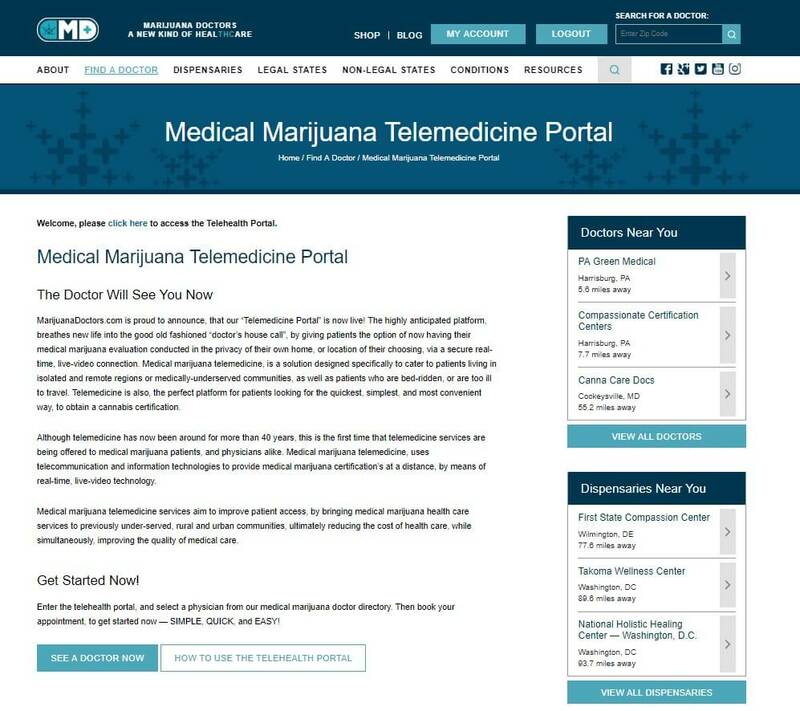 Marijuana Doctors recently launched a telemedicine sub-domain. This site allows physicians who recommend medical cannabis and use this technology to access over ten thousand patients seeking compassionate care services online, daily. Medical marijuana telemedicine uses telecommunication and information technologies to provide medical marijuana certifications at a distance — by means of real-time, live-video technology. A middle algorithm was created to fairly and evenly distribute patients to doctors in the same state and in the order users register with the site each day. 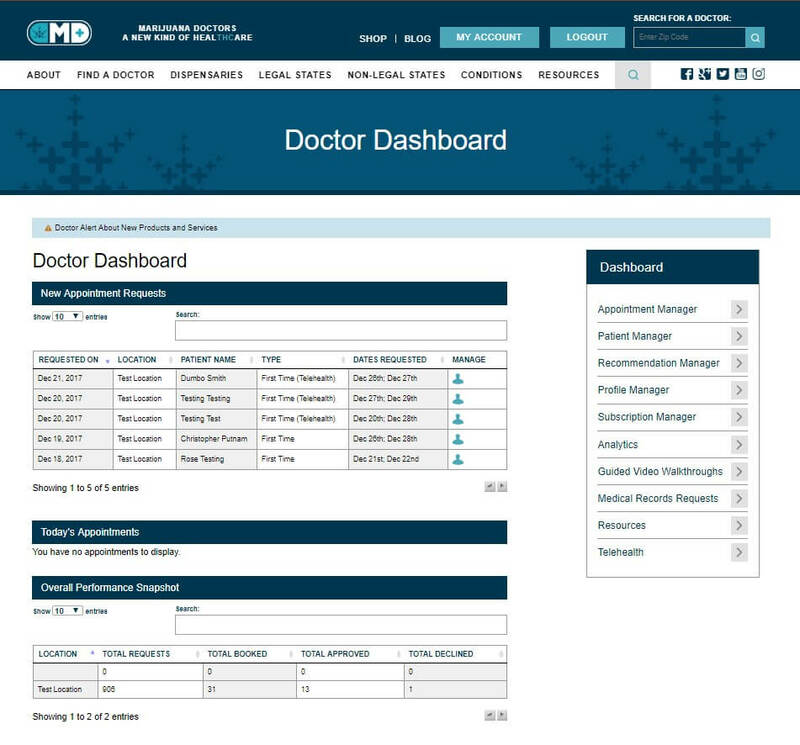 When a doctor is ready and in front of their computer, a highlighted button will appear on the homepage of MarijuanaDoctors.com informing patients that the doctor is ready to see them now. Marijuana Doctors is a complete all-in-one medical marijuana tool, allowing doctors to become more relevant in the medical cannabis space, cementing their digital footprint online and quickly ranking them at the top of search queries on the internet. Marijuana Doctors also provides calendaring, free verification and symptom tracking services. Telemedicine doctors can use the recommendation generator for all legal states, enjoying the added benefit of being able to upload the patient’s driver’s license and digital signatures. After receiving a recommendation via the telehealth portal, patients may also book an appointment with their local dispensary, as well as their return visits with their physician, and can use their app to verify them at the dispensary. In addition, patients may select text message reminders for appointments, recommendation renewals and push notifications to the app. MarijuanaDoctors.com utilizes organic SEO to provide solutions applicable in even the strictest states.